After some recent soul-searching, I realized that I had been falling short of eating enough fruits and veggies for the past few years due to bodybuilding. Since a bodybuilding diet places a huge emphasis on getting enough protein, I’d sadly skipped out on veggie side dishes and servings of fruit more often than I care to admit. Over the past few months I’ve done lots of research on what exactly a vegan bodybuilder might eat and found out that there quite a few of them out there, like Nimai Delgado. Using Nimai and other athletes as inspiration, I’ve reincorporated lots more plant-based foods into my diet and I’m feeling terrific and happily, maintaining my muscle mass just fine! I’m certainly not completely vegan, but I’d say probably 90% of the time I choose plant-based meals. 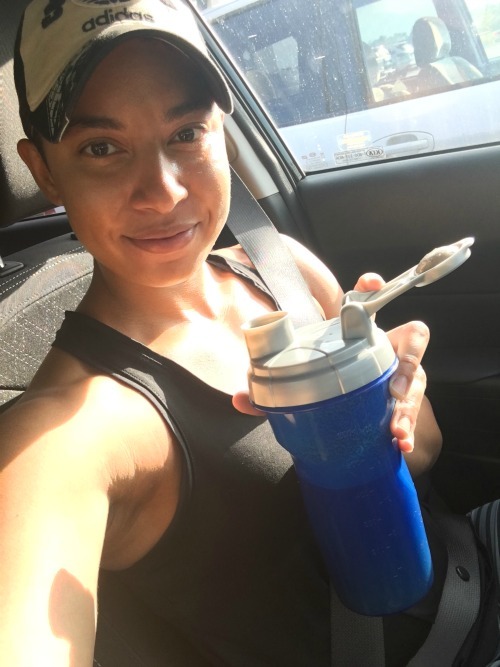 So in case there’s anyone else out there looking for proof that being a vegan bodybuilder is possible, I decided to document a full day of high protein totally-plant-based eating! For my first meal, I weighed out one serving each of the cereal and the almond & cashew milk with my trusty $10 food scale. I like this milk because it contains pea protein to give it an extra boost (most nut milks don’t have much protein, if any). I also had about a cup of fresh strawberries because fruit in the morning makes me feel VIBRANT somehow. Def a placebo effect, but whatever. This black bean spaghetti is a brand new find! I saw it at the grocery store and had to try it because it boasts 25 grams of protein per serving and is made from just one ingredient — black beans. Seriously, that’s the only ingredient listed! I am pleased to report that I found the spaghetti really tasty! I also thought the portion size (2 ounces) was generous and it looks like I’ll be able to get four servings out of one box. 10/10 would definitely buy this pasta again. I topped it with a serving of your average Prego pasta sauce and the macros for this meal came to 29g carbs/3g fat/26g protein. After lunch I needed a little bit of a break from work, so I headed to my apartment complex pool for an hour or so. It’s nice to be able to walk there, get some sun, take a refreshing dip in the pool, and then head back home with a clear head! I just brought my water bottle to the pool with me this time but sometimes I’ll bring a smoothie to sip on or some fresh fruit to munch. Speaking of smoothies, after I got back from the pool I had a green one! I often have these for breakfast, but today I ended up having it later in the day. My go-to smoothie recipe is to blend about 1.5 frozen bananas, a serving of a frozen fruit blend, some spinach, and several ounces of coconut water. It always turns out perfectly — the coconut water is key. I use this Ninja blender and it works great for me. Around 5:00, I got a protein shake ready to take with me to the gym. 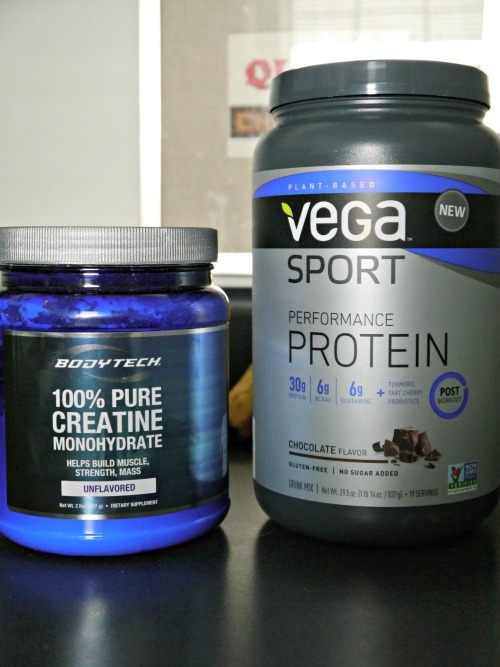 I like to use one scoop of Vega Sport plant-based chocolate protein powder and a teaspoon of creatine. I put them into a shaker cup sans water, then add water from the drinking fountain at the gym after my workout. I love the taste and blendability of this protein powder but it’s so finely ground that it flies EVERYWHERE when I’m trying to scoop it into my shaker cup. Oh well! 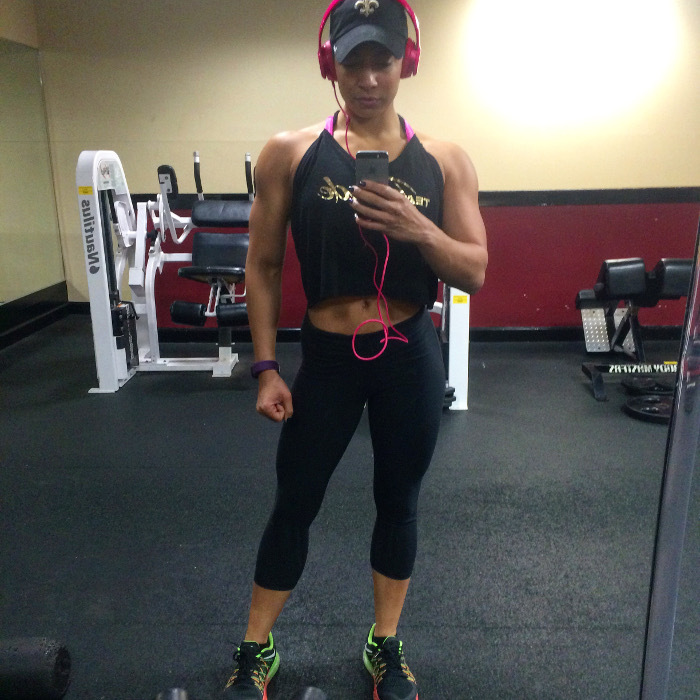 Post-leg day protein shake selfie! For my final meal of the day, I heated up some leftover baked Sriracha tofu and rice that I’d made the day prior. I used this recipe from I Love Vegan for the tofu but used sesame oil instead of olive oil for a little extra flavor. 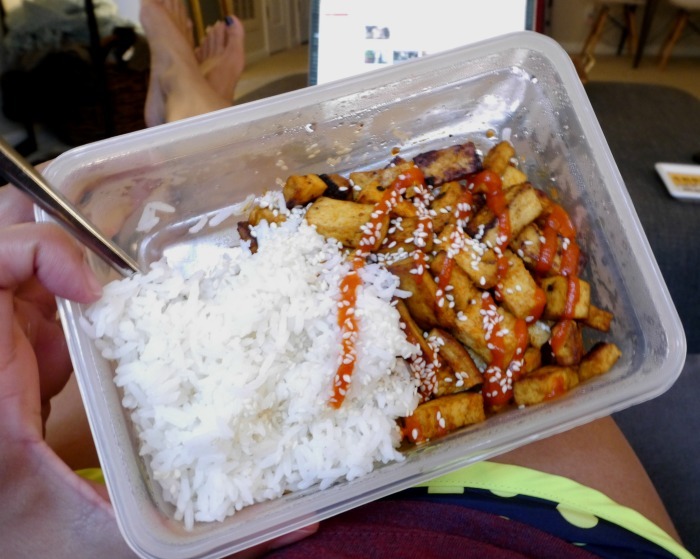 Regarding tofu: I can typically eat about 1/2 container of extra firm tofu for a meal, which comes out to 20-30g protein depending on the brand. That works out perfectly because studies have shown that 20-30g protein is about all your body can absorb at a time. I’m sure there are other studies out there that refute that claim (aren’t there always?) but it’s what I personally ascribe to as it seems logical. Haha. My macro totals for this day came to 200g carbs, 40g fat, and 115g protein. I was a little bit under my goal macros in all three categories and therefore under on my calories for the day, but I felt okay about it because I ate as much as I felt hungry for. Like I said, I’m not vegan but I do choose plant-based options most of the time and this day of eating is an accurate representation of what I typically eat. I hope this helps you if you’re a vegan bodybuilder looking for high protein meal options! I certainly respect your lifestyle and discipline. I am not vegan or vegetarian, but I do love my smoothies! That black bean spaghetti looks amazing! Have you tried the lentil noodles? Those are great, too. 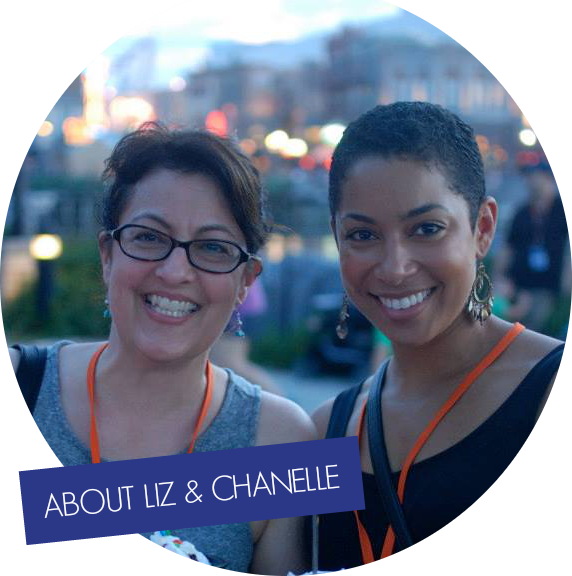 I love to see people who are dedicated and focused in living the healthy life – just like you. I am not vegan, but I just love my dairy and meat. I guess I will just have to choose really lean portions and low-fat dairy. Thanks for always being an inspiration to live the healthy life. It makes me happy to see someone who is really determined to stay in track with healthy living. I wish I could do as you do, but I don’t think I am ready to give up meat and dairy. 🙂 I would enjoy those cashew nuts though. I love my fruit and veggies. I have the P90X workouts as well. Interesting!!! Whenever I think of bodybuilding and meal planning I always think of chicken (protein) so I never really gave any thought to plant based proteins. It definitely sounds like you have your food in a day all planned out. I bet you feel great too! These are all great healthy eats. 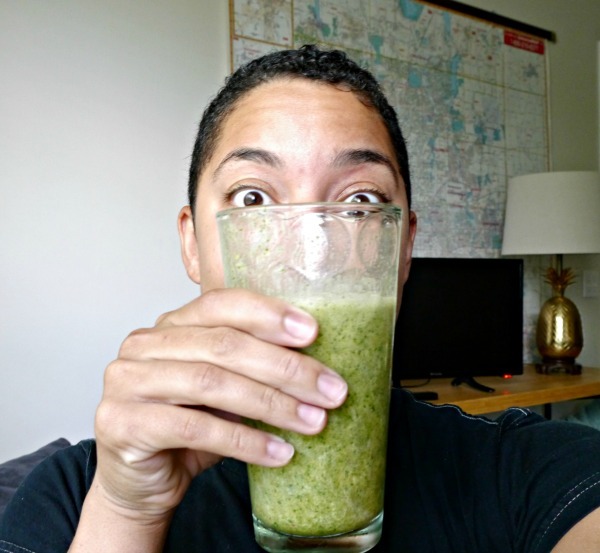 We have green smoothies most mornings. Last summer we dried a lot of our kale, ground it up for adding to smoothies. It’s really tasty! Its always nice to put in a plant based diet a couple days a week. Loving all these products. 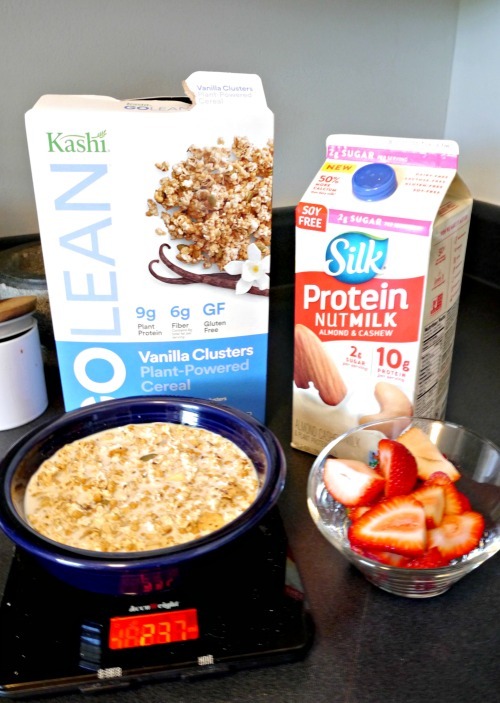 Kashi is one of my favorite brands. So healthy and I always have a ton of energy when I start my day with their cereal. I have thought a lot about trying to do all plant based even if it is just for a trial period, and I always get scared because I think I am going to be starving all the time. You made it look totally possible. I think I might have to give it a try and starting switching some of my meals to all plant based. Yum it all looks and sounds good to me. Super healthy, and what I strive to be able to eat in a day! This is awesome! I love smoothie to start my day! Thanks for sharing your daily meal! I challenged myself to follow a whole 30 diet and I’ve been used to eating more fruits and veggies because of it. I think it’s nice that there’s an alternative to your old diet and this includes relying on the goodness of fruits and veggies! I am definitely not a body builder but it’s awesome to get some tips on what you can eat when you’re trying to switch to a vegan diet. I love that pasta and I would like to sample it. I can’t believe it only has one ingredient. There are so many options for a plant based diet, glad vegan is working for you. I love that you have plenty of healthy and yummy options to stick with this diet choice! I’m feeling inspired! I really want to try something new and healthy with my diet. I need a change. Love seeing what others eat each day! I too am not a big fan of vegetables only because I don’t know a great way to prepare them. Today I ate salad for lunch and I was full! You just have to train your mind like you train your body! You look terrific and I think your dedication is admirable and shows your passion. I never really thought about a bodybuilder not eating things like meat or dairy so this was interesting to see. Everything you shared looks really good! We don’t usually eat these items but I’d totally be willing to give them a try. I really am intrigued by a plant based diet. Thank you for sharing. That is a fantastic meal plan for vegans! It all looks delicious too – I’m not even vegan and would enjoy a day full of this stuff! I’m loving all of these health tips! I so want to try and make that spicy tofu dish! Sounds like you take great care of yourself. I am so making a green smoothie in the morning for breakfast . Looks like you’ve got some great options going on here! I’m excited to hear you liked the black bean spaghetti as I have that sitting on my shelf to give a try this week! I typically do a plant based diet, but this week everything seemed to be left in MASS! I went on vacation to VA and my diet is terrible…seriously splurging like nuts. Thanks for sharing your food plan. It’s so hard to find the right balance between health and taste, but it looks like you have found that balance. That looks like some very healthy meals. I would love to start eating a plant based diet. I think this would be a great start for me too. I’m not vegan, but I don’t really eat a lot of meat. That tofu recipe looks pretty tasty, and I am a big fan of that black bean pasta. I would love to try black bean spaghetti with tomato sauce. I am always looking for Vegetarian meals to try. I am not vegan so I don’t know a lot about it but I will say what you have there looks very good. Even though I’m not vegan I would be tempted to try this. I went vegan for a while! You are seriously rocking it! I don’t think I could go vegan but there are great options out there. I am a fan of smoothies and I love cashews. It’s amazing how much protein you can get even on a vegan diet. I would like to try the black bean spaghetti. 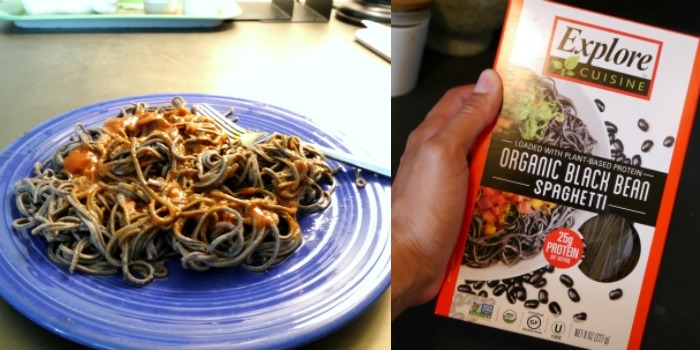 I am super intrigued by the black spaghetti myself! Sounds so cool! I am not sure if I could ever go vegan. I really like my dairy but this looks like a great diet for those that can do it! I need to give this a try! I’ve been thinking about going vegan, but I always thought that it would inhibit my muscle. I’m glad to know that’s not true! 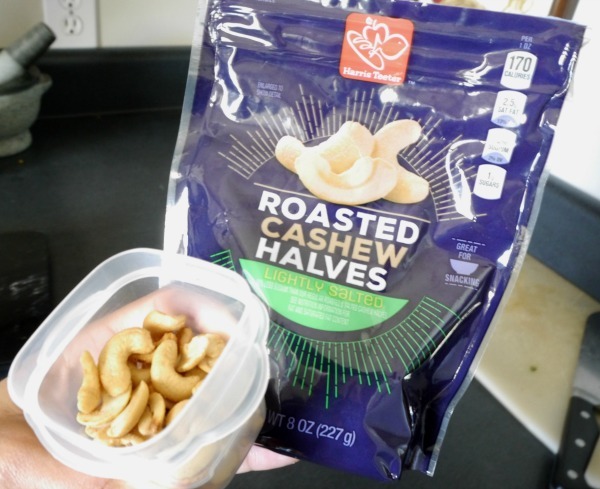 I love cashews but I’m not a big healthy eater although I love veggies and fruits! I could never go vegan. I love dairy products too much. However, I am not a huge fan of meat. I have always been more of a veggie girl. I also love beans — full of healthy lean protein! I have a smoothie almost every morning. It’s a great way to start the day! Oh wow. I’d always heard that you couldn’t be a bodybuilder and be vegan. Just another myth, I guess! I have smoothies everyday. I ALWAYS start my day off with one. It’s so good, and it’s so healthy. Im a big smoothie fan! This all sounds very similar to what I eat in a day. Love seeing others meals!